HBO has released a promo for the final episode of Getting On. Fans learned the show was cancelled back in February, when HBO announced the third and final season. The Getting On TV series finale, “Reduced to Eating Boiled Magazines and Book Paste,” airs Sunday, December 13, 2015, at 10:00pm ET/PT. In the finale, the staff of the Billy Barnes Extended Care Unit faces the ward’s closure. 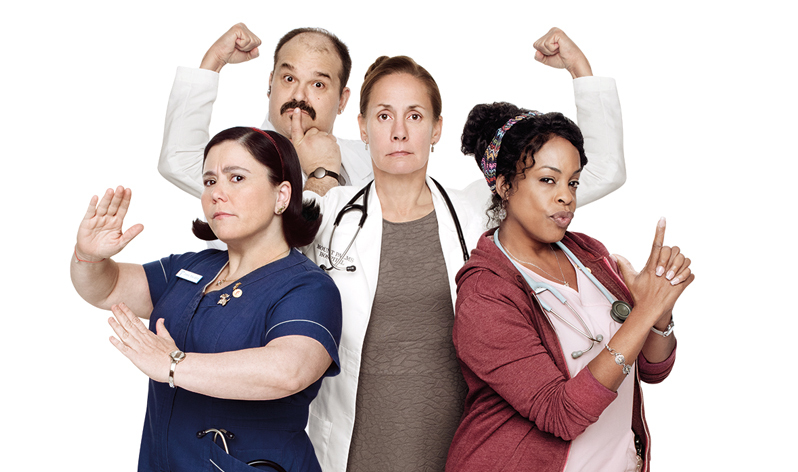 The Getting On cast includes Laurie Metcalf as Dr. Jenna James. Alex Borstein is Nurse Dawn. Niecy Nash plays Nurse DiDi. Mel Rodriguez is Patsy De La Serda. What did you think of the HBO’s promo for the last episode of its Getting On TV show? Do you think Getting On should have been renewed for a fourth season? Let us know, in the comments. I can’t believe HBO cancelled this show! I was so in love with it…. Noooo….. Please bring it back! I enjoyed the series & although I would not have minded if there were new episodes. I think the last & final season was very good. Getting On is a great show that had more story to tell. I can’t believe it was cancelled, but then again HBO renewed The Leftovers for a third & final season, another show that still has wind in its sails. I am so sad to see that hbo cancelled this show. I just found it and absolutely love it. Nooooooo I can’t believe this I love this show, I’m hooked and y’all are doing this to me! Why why why? This show is as real and true and hilarious as it gets! It speaks for every RN who can’t say how she really feels, for obvious reasons. It’s not only amazing entertainment, but it provides a sense of validation for those of us that know the feeling. HBO is making a mistake by canceling such a great show. Please reconsider! I work for a major hospital, and this show is as real as it gets. Absolutely hilarious! HBO made a bad decision by not adding more seasons to this show. I can not believe HBO pulled this absolutely amazing show!!! I have NEVER laughed so much watching a show!! Please bring this back next season!! They must keep it on. There very few places in the entertainment world we find the love and compassion for the sun set of life but on this show getting on. It makes absolutely no sense why HBO would cancel one of my favorite shows of all time. My soul hurts. Every time I get attached it goes. I’ve watched every episode faithfully and will be very sad to see it end. For shame HBO for shame. I think HBO is foolish to cancel Getting On as this writing team has hit their stride in season three producing one of tv’s most intriguing mixes of dark comedy, social commentary, and an unexpected dash of real soul-satisfying humanity. I enjoyed season one; really fell in love with season two. But when season three comes to an end on Dec. 13, I fear what I’ll find to fill the void when such a wonderful tv show leaves the air.